What is most striking about the development currently occurring in the Camden area is the change of large expanses of open land to urbanized dwellings and town centres. It leads many to wonder what other changes occurred with land use in the area. Numerous enterprises were attempted, and although some are considered the start of the Nation’s wealth, many have not continued in the Camden area. Camden is known today primarily as a dairy producer, and although it was in the 1880s that dairy became the primary industry of Camden, it was about a century before that when cattle first came to the region. Cattle were brought in the early days of the settlement, but many escaped due to the lack of fencing, creating a population of wild cattle that would eventually wonder beyond the settlement. It was Governor John Hunter, after hearing reports of wild cattle around the Nepean, who decided to explore further in 1795. The area in which the cattle were found became known as “Cowpasture”. The cattle became almost sacred, deemed the property of the Governor and protected. But this status did not last. The land grants to John Macarthur in Camden in 1803 and Major Henry Colden Antill in Picton in 1822 required the cattle to be rounded up and slaughtered, becoming the sacrificial calves of Australian agriculture. Part of the reason for the slaughter was the need for the land, but also because the wild cattle were not only uncontrollable, but, as Governor King described in 1801, “so vicious as to be not easily approachable”. Additionally, the meat and dairy they produced was deemed unsuitable. Now clear of the wild cattle, the Macarthurs transformed Camden with the three enterprises that spelled the “Birthplace of the Nation’s Wealth”: wool, wheat and wine. 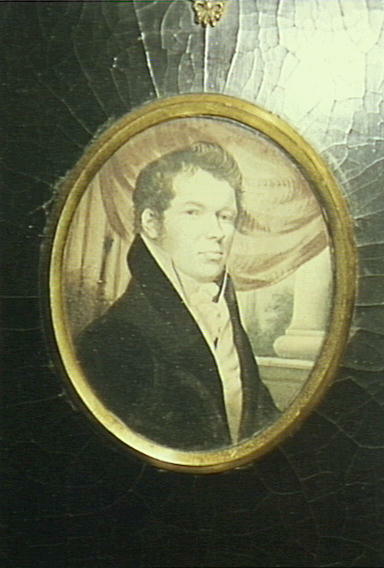 Copy of portrait of John Macarthur in the library at Camden Park House. Wool is the most famous of the three and was a significant success. By 1830 they produced over 18,000 kg of wool that they shipped to England. This was not merely a bulk enterprise, with the wool being of a consistent high quality that encouraged “contemporary envy and grudging admiration” (Kerr, 1960). This came from Macarthur’s breeding of two stocks. His original flock was of Benghal sheep that he farmed on the small land grant of Elizabeth Farm in 1793. In 1797 he gained a flock of “Gordon” merinos and successfully bred the two. The flock produced the famed wool of high quality. It was at this point that Macarthur decided to breed sheep for wool rather than the meat the colony so desperately needed. This gamble paid off when, in 1802, Macarthur went to London to face court martial charges. 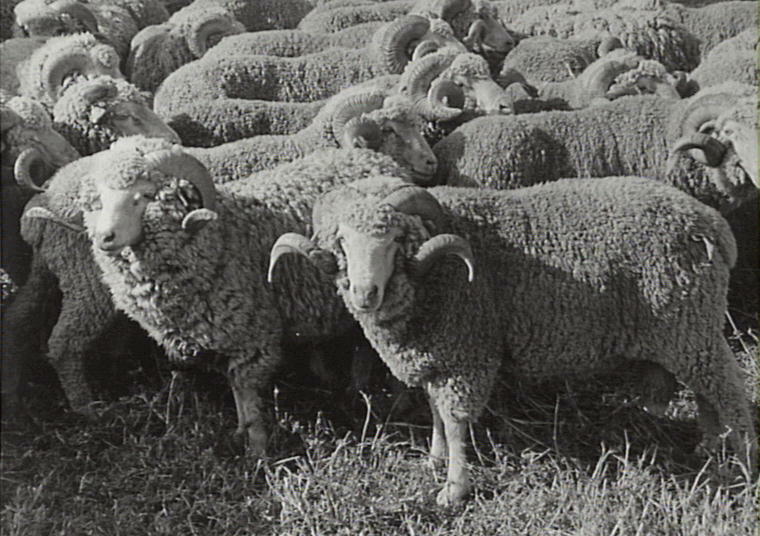 The charges were dropped, but Macarthur utilized the trip to show samples of the wool produced by the flock and the industry had a booming start. Macarthur then secured the Cowpasture land to expand his enterprise. However, the land was not always welcoming to industry, and in 1840 a severe drought required the animals to be transported to greener pastures. The stock’s purity was retained by William Campbell in Victoria, with some of the sheep finding their way back to Camden in the 1880s. Although they returned, wool would never again be the primary industry of the area. Descendants of the original Macarthur flock, now at the Elizabeth Macarthur Agricultural Institute. 1980. With large, empty portions of land available, Macarthur turned his attention to wheat. He divided the land into “clearing leases”. These required the lessee to clear and fence the land, build a dwelling and grow their won crops. Macarthur wheat had a strong reputation with one of Macarthur’s lessees, Thomas Dunk of Cawdor, winning the gold medal for “the best wheat in the world” at the Great London Exhibition of 1851 (Nixon, 2005). A similar medal was won by Henry Gumbleton at the Paris Exhibition in 1855 using the same strain. The wheat was not only produced in Camden but also milled into flour. Henry Thompson operated a water powered mill in the 1840s, and the expansion of the industry required him to change to steam power to cope with the demand. His confidence in the industry’s longevity is evidenced by his building a brand new mill in 1858. The flour, like the wheat, had a strong reputation and was used extensively. Seemingly establishing the primary industry in the area, this, like the wool enterprise, was not to last. It was plagued by rust, with the first outbreak occurring as early as 1803. However, this did not halt the industry, but two severe outbreaks in 1861 and 1863 devastated the crops causing many farmers to seek ends meat elsewhere (Nixon, 1998; Robinson). The industry collapsed. 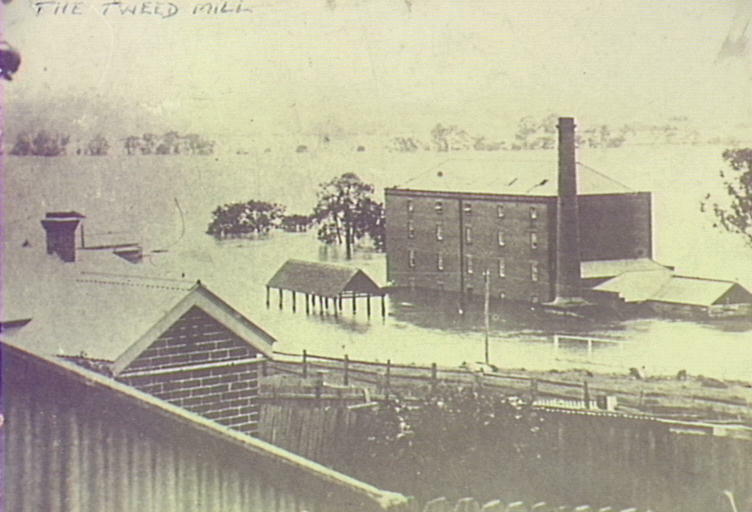 Thompson’s Mill, inundated by flood of 1898. The last of the Ws was wine. This did not have the runaway success of the wool or wheat industries, but it was considerably more stable. It was John Macarthur’s sons, James and William, who established the enterprise. The first successful wine maker in Australia was Gregory Blaxland, who made silver and gold medal winning wine from his Brush Farm near Eastwood in the early 1800s. It was around the time of his success that James and William made their first unsuccessful attempts. This changed when they gained a 20 acre property on the slopes of the Nepean River. The venture was a success in numerous fields. By 1827 they produced 100,000 litres per year and it was highly regarded both in Australia and abroad. What made their enterprise unique was the scale, with it being recognized as the first commercial vineyard in Australia and the Hawkesbury/Nepean region being considered the ‘cradle’ of the Australian wine industry (Penfold, 1989). The wine industry, unlike wool and wheat, has remained within the Macarthur region, although never becoming its primary industry. The later part of the 19th century saw another industry establish itself in Camden, one that would remain well into the 21st century despite the changes. This was the dairy industry. Kerr, Jill. (1960). Merchants and Merinos. R.A.H.S. Journal. Nixon, R.E. (26.11.98). Camden’s Wheat Industry Blighted. Back Then. District Reporter. Nixon, R.E. (4.3.05). When the Local Wheat was World Renowned. Back Then. District Reporter. Penfold, Barry J. (1989). Wine Regions of New South Wales. Secret Wines of New South Wales. Kenthurst Kangaroo Press. Robinson, Steve. (n.d.) Camden West.